“Beat & Path” is David’s newest collection of works and will be featured at his solo exhibit at The Brick City Center for the Arts, Ocala, Florida, December 1–31. Meet-the-artist opening reception, Friday, December 7, from 5 to 7 pm. Brick City Center for the Arts. 23 S.W. Broadway, Ocala, Florida 34471. Live entertainment and light refreshments. Please join us. Best of the Season, the annual juried exhibition sponsored by the Visual Artists’ Society, includes two of David’s three-dimensional pieces, “Eve of Destruction: Rise of the Dark Princes,” a VAS award winner, and “The Last Vestal Virgin.” On view now through December 7, at the Webber Gallery, College of Central Florida, 3001 SW College Rd, Ocala, FL 34474. 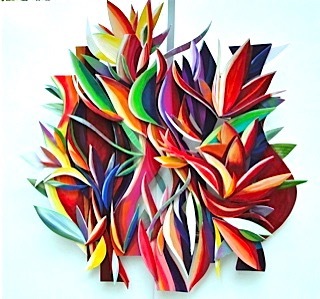 See ten of David’s signature "cutaways,” brilliantly colored and intricately constructed wall reliefs at Molly Maquire’s, downtown Ocala’s popular eatery, 17 SW 1st Ave, Ocala, FL 34471.